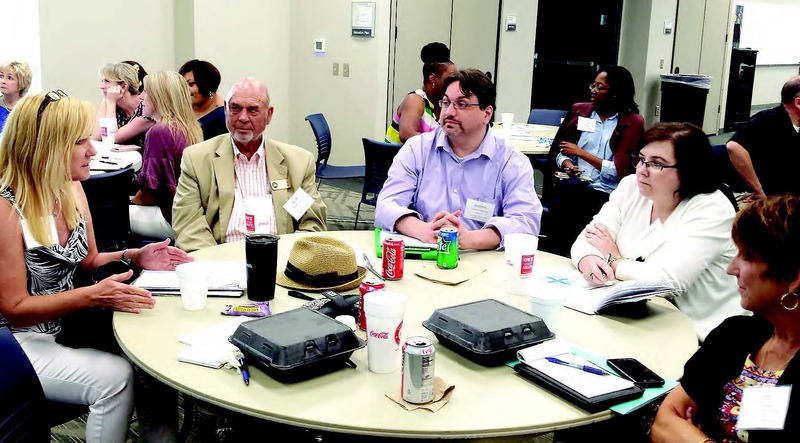 Local representatives recently joined other Middle Georgia stake­holders to participate in a regional charrette to create an economic action plan predominantly independent of Department of Defense contracts. The GDEcD’s Workforce Division and Center of Innovation for Aerospace was awarded a grant from the DOD to study current DOD contract work being conducted in Georgia, including Robins Air Force Base, the largest single-site industrial complex within the state. Putnam County Development Authority Director Terry Schwindler, Eatonton Mayor Walt Rocker Jr., City Council Member Janie Reid, Main Street/Downtown Director Andrew Simpson and Eatonton Messenger reporter, Shannon Sneed, were the Putnam County representatives who partic­ipated in the “think tank” on June 15. Led by David Beurle, of Future IQ, a consulting and research company specializing in foresight and scenario-based strategic planning, the meeting was sponsored by Middle Georgia Economic Alliance, an 11-county region consisting of Putnam, Baldwin, Bibb, Crawford, Houston, Jones, Monroe, Peach, Pulaski, Twiggs and Wilkinson counties. According to Beurle, the intention of the regional planning process is to build on what RAB, one of the largest drivers of economic activity in the region, provides already, and explore ways to develop business in other markets. The regional planning process began in February and will continue through November. Divided into several groups to network on a scenario development exercise, participants were asked to be ambitious in trying to predict what the region would look like in 2030 while taking into con­sideration both good and bad possibilities as well as how politics or natural forces might play a role in that environment. Beurle directed the groups to identify where they might be vulnerable and where they are strong and to think about real­ity-based scenarios that would show what commu­nities, society, quality of life, environment, housing, regional transportation, entrepreneurship, school systems and the sales tax base might look like in 10-20 years. Beurle instructed partic­ipants to strategize around leadership development in the region and think about how to identify and attract like industries; how to build trust and goodwill among elected and community leaders to forge collabora­tion; how to merge regional planning and government activities; how to build an innovative ecosystem; and identify private funding to expedite public projects. Presenting the group with a graph of a series of rings, representing zones, around a central point, representing a metro area, Beurle explained that metropolises are now con­sidered “zones of innova­tion,” and the communities within a 30-mile radius are in commuter zones. The graph showed that outside the commuter zone is the assembly and delivery zone, and outside that is the large production zone. Participants were asked to get an idea of where they are in proximity to the closest metropolis and think about how to monopolize on the zone they are in, which could help promote coordinated local action as well as build a successful regional asset portfolio. Beurle instructed the groups to take into consid­eration how merging micro drivers such as technology will cause global change. “One piece of technology can change an industry,” said Beurle, advising how technology enabled the fracking of shale oil and caused the U.S. to go from being energy vulnerable to energy efficient. He advised the groups to also take into consid­eration the future with 3D printing, or additive manufacturing, which is the process of making three-dimensional solid objects from a digital file. “They suggest the first thing you do when you get the printer is to build spare parts for it,” said Beurle. He said to take into con­sideration that the median age is expected to increase four years. Currently, the U.S. is 82 percent urban and those urban areas are expected to add 100 million people within a few years. Beurle noted that due to increase in popula­tion, there will be a 60 percent global increase in food demand by 2050; a 50 percent increase in demand for energy; and a 40 percent demand for water, meaning a “greater urgency for this region to figure out who it wants to be when it grows up. Health costs are pre­dicted to decline because of gene sequencing and other technological break­throughs putting the world on the cusp of a revolution for cheaper and more effi­cient medication. The groups took into consideration renewable energy cost trends. He advised 70 percent of the world’s fresh water is used for irrigation, and studies show that two-thirds of the world’s population will be water-stressed by 2025. 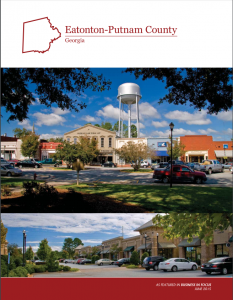 Using the data collected from the workshops and “think tank,” Future IQ plans to provide a road map to an economy in Middle Georgia that is more resilient to DOD spending fluctuations.